It's been a trying week. While getting our house in order after losing power for a week, cleaning up, and getting the boys off to day care each day, it's been tiring to say the least. The thing that really set me off was after the first day of day care they sent us home with six dirty bottles. That means that every night after getting home, cooking dinner, and puttin the wombats to sleep I need to clean six bottles and three sets of Jen's pumping equipment. I probably should have assumed this would happen but for some reason I figured with the thousands of dollars a month we were spending that the day care place would just take care of everything. In fact, for the money we're paying it would be great if they picked up and dropped off the babies to our door at the end of the day. Nothing this expensive should be this much work. Luckily yesterday's storm didn't amount to much other than a good accumulation of snow. This gave the Wombats their first experience with the white stuff. They enjoyed this tremendously from the coziness of their fleece-lined car seat liners. After getting home and dealing with a 90-minute gripe session from the guys I cracked open a beer for the evening. Jen getting home from work seems to signal the end to the guys' early evening fuss each day this week. 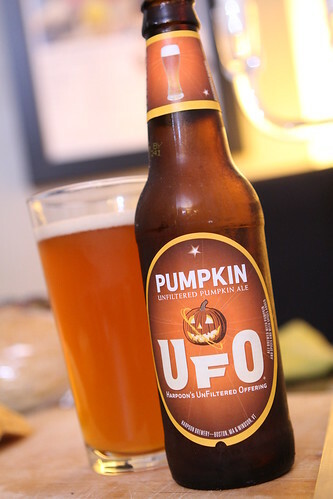 I took advantage of this tonight by opening this UFO Unfiltered Pumpkin Beer by Harpoon Brewery. This was easily my favorite of the non-imperial pumpkin beers of the season and even beat out one of the imperial versions. It was a well balanced wheat-style that didn't overdo it with the pumpkin and spice flavors. I'd recommend this one highly. While the guys were fussing I threw dinner in the oven. 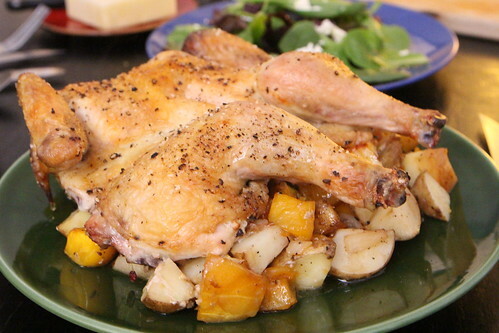 I tossed some garlic, onion, butternut squash, and potato from the farm with olive oil, salt, and pepper and roasted them in the oven for a while before throwing a spatchcock chicken on the top. Roast chicken is a favorite of Jen's and it just so happened to be easy to put together while Martin shrieked in a crib and Elliott slept in his car seat. After dinner I cracked open this Four Ale from Allagash Brewing Company. This was in celebration of today being the Wombats' four month birthday. It's hard to believe it's been four months already. It seems like four years ago and, judging by the way I look in this picture, it certainly looks like four years ago. After dinner Martin tried to call his Aunt Lauren to discuss his four month birthday and what it meant to him. She never answered. This is strange considering she calls them twice daily to talk. After a moment of self reflection he and Elliott when to sleep for the evening wondering if they would ever get to express their excitement over turning four months old. Some day, they thought. We will be able to talk to our Aunt Lauren about this momentous occasion. Some day. It's completely unfair. I feel like someone else should have to do all the cleaning of dishes. By the time you get done with your day it's just not fair that you have to do that too. It's easy to see how some parents snap.